I just had to try the espresso creme brulee at a local restaurant recently. It had just a hint of cinnamon, and the espresso flavor was just strong enough. I decided to try making my own, and this recipe exceeded my expectations. 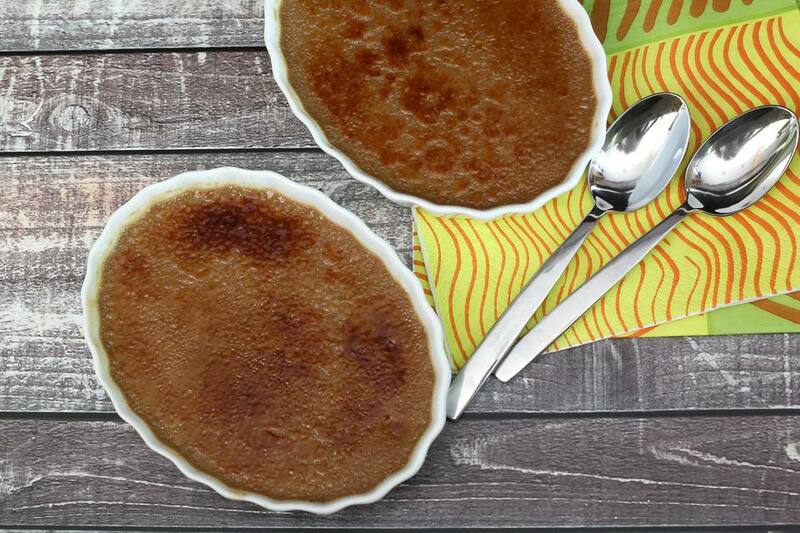 This smooth, creamy espresso creme brulee is made with a perfect caramelized sugar topping. I use a kitchen torch for the topping, but you may also put the creme brulee under the broiler. I like superfine sugar for the topping. It caramelizes more quickly and evenly than standard granulated sugar. Others swear by turbinado or raw sugar. You might want to experiment a bit. Use 4-ounce or 6-ounce ramekins for the recipe. In a saucepan, combine the heavy cream, 1/3 cup of granulated sugar, and espresso powder. Blend well and bring the mixture to a simmer. Pour through a fine mesh strainer into a bowl and set aside for about 15 minutes, or until it cools to room temperature. Heat the oven to 325 F (165 C/Gas 3). Arrange 6 to 8 ramekins in a 9-by-13-by-2-inch metal baking pan. If you are using wide, shallow ramekins, you might need two pans. In a medium bowl, whisk the egg yolks with the cinnamon. Whisk in the cream mixture until well blended. Ladle the mixture into the ramekins and fill the outer pan with hot tap water. The water should come about halfway up the sides of the ramekins. You might want to put the pan in the oven before you add the hot water. Try to avoid sloshing when you move the pan. Bake for 30 to 40 minutes, depending on the depth of the creme brulee. They should be set with only a slight jiggle. Very carefully remove the pan(s) from the oven. Remove the ramekins from the pan—use a spatula and oven mitt—to a rack to cool. Cover and refrigerate them for 3 to 4 hours, or until thoroughly chilled. They can be made a day in advance. When you are ready to serve, take the ramekins out of the refrigerator. Sprinkle 1 1/2 to 2 teaspoons of superfine sugar over each creme brulee, depending on the surface area of the ramekins. Gently rotate the ramekin on the countertop to distribute the sugar evenly over the top. Use a kitchen torch to melt the sugar, using a protected hand to move the ramekin quarter-turns as you torch it. The ramekin will be hot, so take care. Alternatively, arrange the ramekins on a baking sheet and place them under the broiler. Watch closely and rotate the pan to melt the sugar evenly. *If you don't have espresso powder, you may substitute about 3 teaspoons of instant coffee.